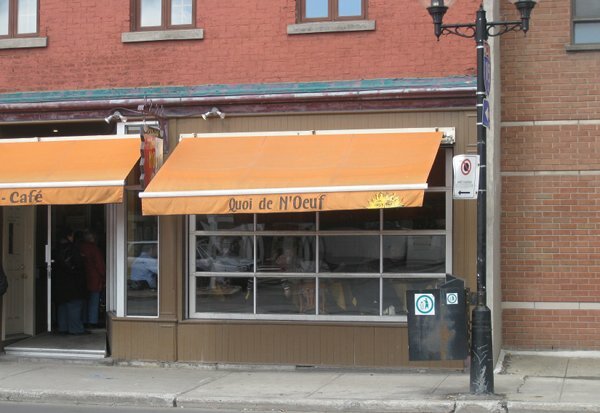 Situated right around the corner of Atwater and Notre Dame, Quoi de N’oeuf is a tiny nice little place that you can sometimes notice by the lineup. However, don’t be scared off by this because not only does the line move quickly, the food is well worth the wait. When we got there we only waited five minutes and the tables turn over quickly. The inside is nice with some red brick and paintings hanging on the inside. There is also a garage door style window that opens up in the summer this makes the inside nice and sunny for the most part with still some nice dark corners for those who have been partying too hard the night before and aren’t quite ready for direct sunlight. The menu is a couple pages long and offer some tasty option all fairly priced in the $9-$12 range. They have five options of french toast ranging from $8.96-$9.95 as well there are sixteen omelette options ranging from $6.95-$11.95 with most being $8 on average. For the eggs Benedict they take a novel approach and offer 1/2 plates as well as full plates; there are 8 options ranging from $9.25-$10.95 for the half plate and $10.95-$13.95 for the full plate in fact the price difference on the upgrade for some items can even be as low as 45 cents or a dollar and in my books, it’s worth the upgrade considering you get double the serving. The crepes offer twelve choices priced at $7.95-$9.95. and the sweet crepe section has four extra ones in the same price range. You can also choose from among five waffle types $8.95-$11.95. There’s also the classic one/two egg with/without meat option that range form $4.50-$8.50 which can be a pretty good deal although some of their signature dishes are worth a try. They also have a health menu with seven items priced between $7.95-$10.95. My friend had the smoked salmon eggs benedict ($11.95) which came with potatoes on the side and three pieces of fruit. 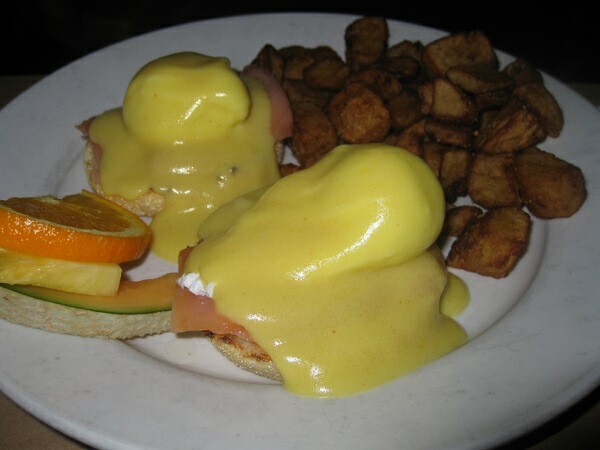 The fruit was good and the potatoes were just right, the eggs benedict were divine the english muffin was nicely toasted ,not too crispy yet not mushy, The eggs themselves were perfectly poached and were neither too runny nor too firm, and you can’t go wrong with smoked salmon. The hollandaise sauce was very good and was generously poured. This was a good thing and although presentation may not look amazing it makes up for it in the taste department. I had the Valet ($11.95) which is basically an omelette served to you in a skillet; this is not found in the omelette menu but in their feature section. I felt that serving the dish in a skillet was a novel idea which reminded me of Mexican restaurants where you get the food on a hot grill and they warn you not to touch it but you still do (you know what i’m talking about). I also had the option of choosing what the topping was. My dish was filled with potatoes, steak, peppers, and scallions. 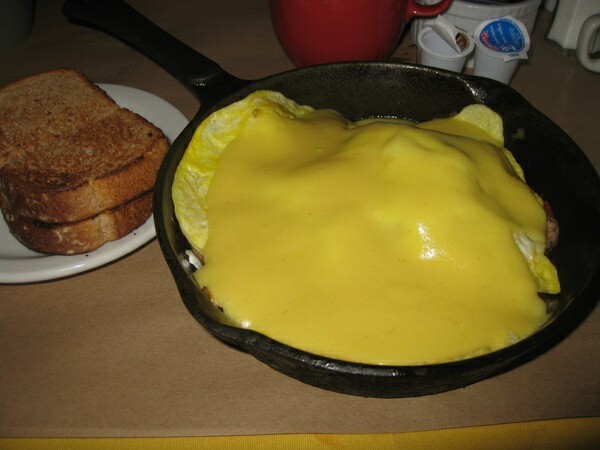 There was an option of topping with either cheese or hollandaise sauce, although I wanted cheese I accidentally ordered hollandaise sauce and I was worried that it would have ruined it since I would not normally put hollandaise sauce on an omelette. Although when the meal arrive I was was surprised to taste just how good it was with the sauce (mainly on account of how good their sauce was). I still think more cheese would have made a better pairing but the hollandaise was that good that is saved me from my mistake. A nice extra is the side of toast that comes with it so I could mop up all the left over sauce and food my fork missed. In hindsight I should of asked for a straw. Our stay here was short but the service was good and our coffee was frequently refilled and our waiter was helpful in explaining some dishes. The plates came incredibly fast, in fact I was quite shocked with just how fast. I guess its also because a lineup forms and it’s not a huge place so they get you your food quickly. There are some vegetarian options in fact most of the dishes by default are vegetarian friendly and in the classic breakfast options the same dish with meat is a separate line item. If you are in the area you should definitely make this a stop and try out their skillet dish as well as everything else on the menu. The service is fast and friendly, the food is tasty and fairly priced, the interior is very nice and I can’t wait for the summer so they can open up that giant, garage door window. Do expect to get a lineup if you show up after 12:00 but rest assured the wait will not be long and the food will be worth it. If you’re one of those slow read the newspapers with a coffee one hour after you finished your meal, please pick another place. The careful balance of fast service and moving lineup will be single-handedly destroyed by you and you will make the brunch experience of everyone in line similar to mine when I saw Ghost Rider or come to think of it 85% of all Nicholas Cage movies. Monday – Saturday 7:00 a.m.-3:00 p.m. The food is very good, at a very good price. But… the coffee is terrible. When will breakfast places learn — people DO notice when you water down your coffee. It’s one of the principal reasons why I hesitate to eat here. Yeah, the food here is ok (cooked properly and service is fast), and it is hard to beat the price, but was let down by their cheese… a place this close to any market has no excuse serving fake cheese. Haven’t been there in a while, but last check it was still miles better than the nearest competitor Toi moi & cafe, whose food I would not feed to my dog. This place is a solid 3/5 for me. We like to go to this place as the service is friendly and fast and the food is alright. The coffee could certainly be improved though I haven’t tried an espresso there. Also the potatoes are disapointing; they are not roasted but just cooked and colored with browning or something, tasteless in the end. Also the egg plates could feature more fruit. I like this place, I find it dependable. The tables are a little close together but the service is good and the food is decent. Terrible food, terrible service; plus the super muscular owner is always around not smiling at people. Way too expensive for 2 pieces of fruits! My gem is Midi 6, a few blocks west of Atwater! The service was horrible! The staff was very unwelcoming and condescending (especially the host) . The food was nothing to rave about. It was a complete waste of money! Avoid this place at all cost! There are other places on this street that offer great customer service and delicious food/coffee.